Stretching 2,000 oceanfront acres in Los Cabos, Mexico, the $2.5 billion Puerto Los Cabos master-planned resort community is the largest development undertaking ever in the formerly underserved area and with more than 25 percent now open and operating, it’s creating a new heart within San Jose Del Cabo’s now booming hotel and residential scene. Since breaking ground in 2005, Puerto Los Cabos has welcomed an impressive collection of luxury hotels, resorts and amenities. Most recently, developer Grupo Questro announced Mexico’s first Ritz-Carlton Reserve residences within the community and $70 million in pre-sales. In November, JW Marriott Los Cabos Beach Resort and Spa opened, with other hotel openings within the last 36 months including Secrets Puerto Los Cabos Golf & Spa Resort and Hotel El Ganzo. Just five minutes from downtown San Jose Del Cabo, Puerto Los Cabos has played an important role in fueling the growth and popularity of the “other side” of Los Cabos. Puerto Los Cabos is home to luxury amenities available nowhere else in the region including a newly-built marina that currently offers 200 slips up to 400 feet in length; a drystack and boatyard with 150-ton travel lift and 24-hour security; a composite 18 holes of golf with nine holes designed by Greg Norman and nine holes designed by Jack Nicklaus; and a 12-acre Cactus Botanical Park that features more than one million plants, including a labyrinth of 1,000 bonsai bougainvillea and more than 1,500 species of cactus and succulents from around the world. Puerto Los Cabos includes more than 700 acres of real estate ranging from entry-level golf villas priced from the low $1 million to $15 million vacation homes. Close to 60 percent of the community remains open for future development. The community’s newest real estate offering, West Enclave, a Ritz-Carlton Reserve Residence is a collection of 27 indoor/outdoor villas featuring more than 10,000 square feet of indoor/outdoor living space, private swimming pools, floor-to-ceiling windows looking directly onto the Sea of Cortez, superbly appointed double kitchens and five en-suite bedrooms. Homeowners and resort guests alike have access to three miles of white sand oceanfront along the base of the Sierra de la Laguna Mountains with a private beach club featuring an infinity edge pool, easy beach access, fire pits and a full-service spa and fitness center. Los Cabos’ newest trend in organic and locally-farmed cuisine is also headquartered in Puerto Los Cabos where the popular Flora Farms maintains a 10-acre organic farm with an accompanying restaurant, Flora's Field Kitchen and Farm Bar; Acre Baja operates a 25-acre farm set within a natural palm grove along with a restaurant, The Restaurant at Acre, and the nearby Huerta Los Tamarindos also features a certified organic farm that hosts orchard tours, cooking classes and a center of outdoor events for parties and meetings. Widely known as the quieter, more private and intimate side of Los Cabos, compared to the bustling, tourist-centric vibe of Cabo San Lucas just 30 minutes away, San José Del Cabo has grown in popularity as visitors seek a more low-key and untouched escape. Featuring an authentic downtown plaza, vibrant art and culture scenes and sprawling world-class resorts, the Gallery District of San Jose Del Cabo has become the cultural center of greater Los Cabos with many high-end fine art galleries featuring local contemporary artists. 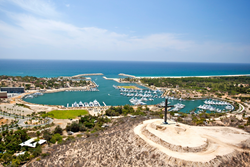 For more information on Puerto Los Cabos, visit http://www.puertoloscabos.com/. For more information on West Enclave, a Ritz-Carlton Reserve Residence, visit http://rcrr-loscabos.com/. Over the course of more than 20 years, Grupo Questro has emerged as one of the most highly respected developers in all of Mexico. Helmed by the visionary Eduardo Sanchez-Navarro, Grupo Questro’s mission is to develop business opportunities of value that generate memorable experiences for its collaborators and clients. In areas throughout Mexico such as Los Cabos, Mexico City and Acapulco, Grupo Questro’s world-class resort destinations include Puerto Los Cabos, El Dorado, Cabo Real and Club Campestre San Jose. Resort projects include Ritz-Carlton Reserve Residences, Casa del Mar, Secrets, Dreams, El Ganzo, ME by Melia, and Casa Dorada. Nationally, company divisions include commercial and entertainment centers, golf, marinas, residential developments, hotels and time shares. For more information, visit http://www.questro.com.